B & H Engineering, P.C. has performed the 2016 Biennial Inspection and 2017 Special Inspection of the Brooklyn Bridge and Approaches, as a prime consultant, for the NYSDOT. 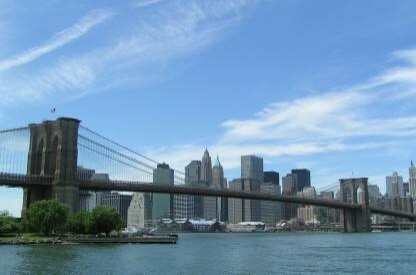 The Brooklyn bridge is a suspension bridge spanning the East River between Manhattan and Brooklyn. The biennial inspection included: review of existing BIN folder, inspection and ratings for members and their paint condition, preparation of inspection and project final reports; quality control review on reports and inspection documentation; creation of primary element database; notification and report preparation of flagged conditions; reporting of flagged conditions; planning and scheduling inspection; inventory verification; coordinating inspection with ongoing construction contract; planning and requesting lane closures; procuring access equipment necessary for inspection; and providing and monitoring work zone traffic control. B & H Engineering has also performed 2014-2015, 2006-2007 and 1996 biennial inspection of this structure as a prime consultant.